+ Gilmore Girls on Netflix, even though I already own all the seasons on DVD. + All things pumpkin, duh. + Dai in his adventuring hat. + The cold ocean water on my feet. + Finally getting over a cold. + Girl time & sleepovers. + Saturdays at the farmer's market. + Beach hike in October. + Weekends with no plans whatsoever. 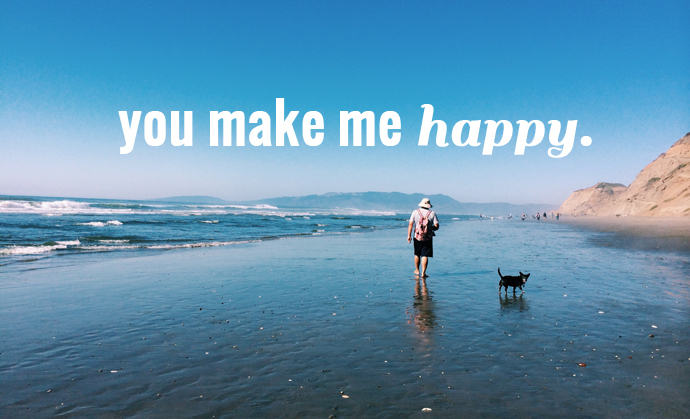 What's on your current 'happy list'? + It's almost sweater season!!! + Really getting into "Last Week Tonight with John Oliver"
Ice cream dates & new months make me happy too! + My house smelling like a cafe in the mornings! It's great to take the time out to focus on what makes you happy and appreciate every simple thing about it, so thanks for this great little post! Farmers markets make me super happy!